Yesterday we say the temperature hit 95 and I thought that was crazy. And then we were out and about this morning and my car said it was freaking 110 degrees. Now that's just insane! We live near the coast, you guys, and I seriously cannot believe this is happening. I stepped outside for about two seconds and felt like I couldn't breathe! So a quick trip for ice cream (which I made Ava enjoy in the car on our way back home to an air conditioned house) and a super fast drive through at Starbucks for this mama and we've been cooped up inside all day long. It's definitely not our idea of a great Friday afternoon as we love spending our days outside but ya gotta do what ya gotta do! For the whole 7 minutes we had real clothes on, Ava had some super cute kids clothes on (per usual) and then we were back home and into just undies just minutes later. But luckily I snapped some quick pics for you because this darling little floral romper is just die for! 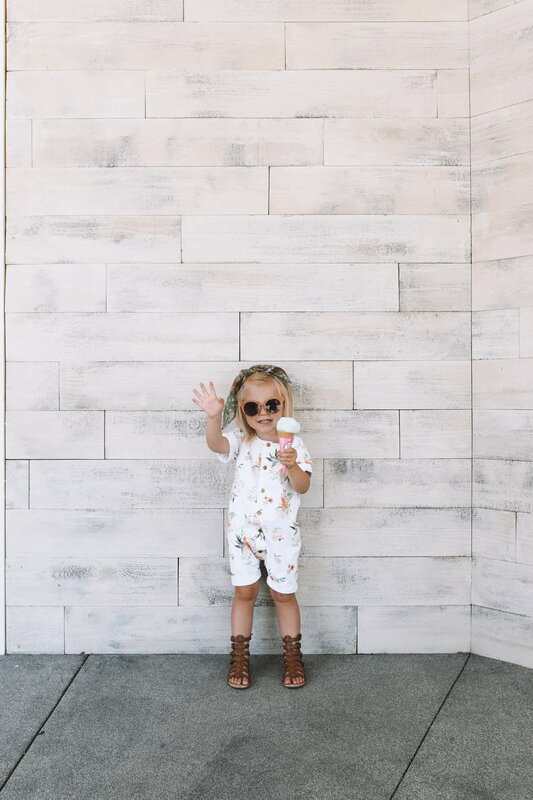 I added a super cute kids headscarf in her hair, our favorite kids gladiator sandals and of course, baby sunglasses to complete her look. click the links below to shop her Friday look!